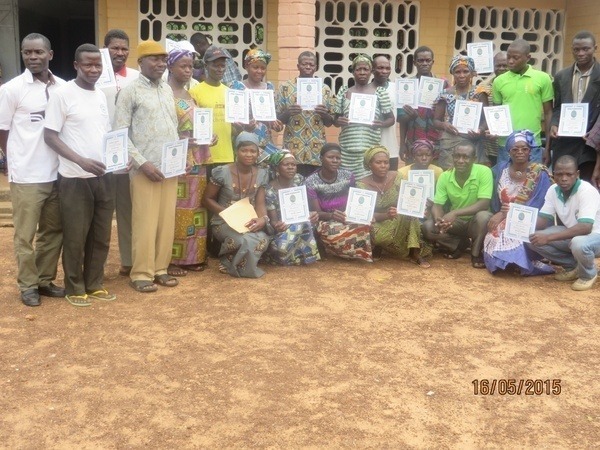 Since 2 years now you have been many people supporting the Ghana Permaculture Institute(GPI). We thank all of you for contributing to strenghten the sustainability-network in Ghana. Many great events have occured over the last few months and we want to share some of them with you. 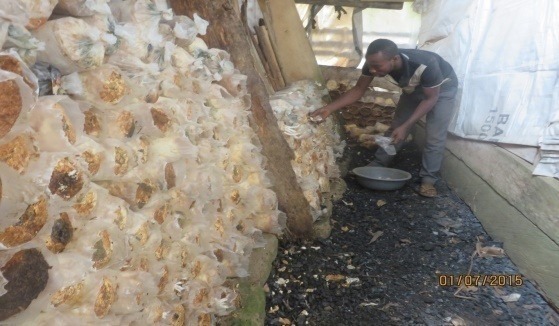 In April, GPI members have visited 3 farms where they had enabled some rural farmers to do mushroom business. After one month each one of them had already harvested and sold over 500 bags of those mushrooms that most of the local people like to eat! 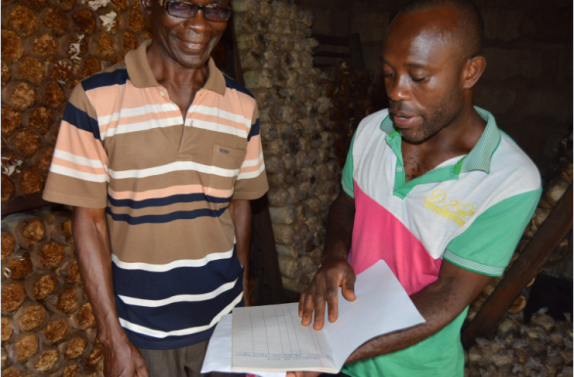 On the left side of the below picture, next to Richard, our GPI mushroom expert, you can see Mr. Ishak who participated in the workshop and is now one of the farmers who maintain the cropping house. He told us that he is very happy of his new regular and ecological source of income. This is one great example of the Green Business Workshops which has a direct impact on the living conditions of farmers. In May, GPI held a workshop to train farmers to integrate beekeeping in the activities of their farms. 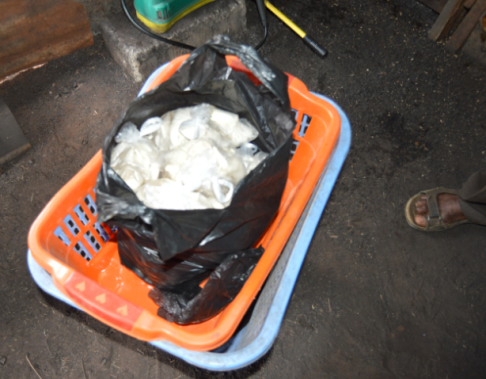 They learnt everything about the Apis mellifera, the honey bee specie that occures in Africa, so they can produce honey, propolis, wax, venom and royal jelly and generate another source of income. 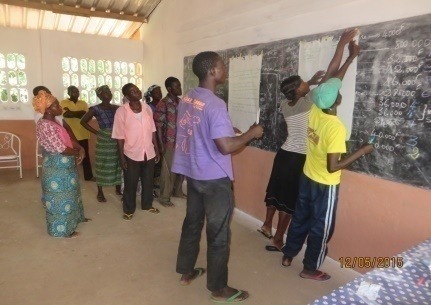 A bit later in May, 19 people took part in the PDC to better understand the patterns of nature earthwork, to learn how to use aquaculture, to improve their finance and to increase the quality of their soil by working without chemicals. Eventhough some participants, being french speakers, struggled understanding english they were all very satisfied at the end of the course. 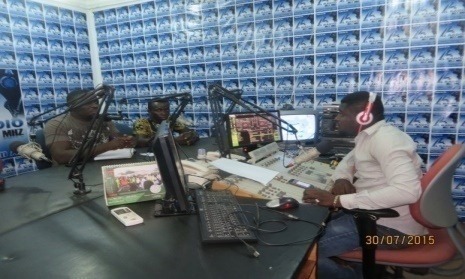 In July, members of the GPI participated in a talk show on environmental issues. They went across the risks associated to pollution in the country and had the chance to share their advocacy to a larger audience. 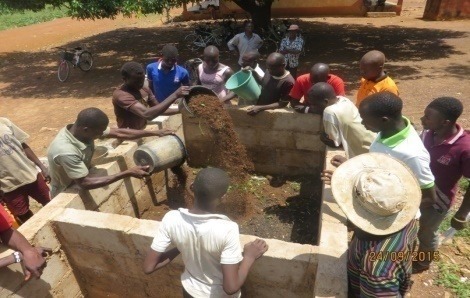 In September, they organized another workshop to teach 17 participants the basics of compost and how to build a waste management system. Now the participants can transform their wastes into resources, have healthier crops and soils and avoid buying chemical fertilizers that are anyway too expensive for most of the farmers. These are just some examples of the achievements of this great project so far: More activities are coming next year. Be aware of the #GivingTuesday ! to become changemakers and be the roots of the growing sustainability network in Westafrica, we will launch our Christmas crowdfunding campaign on the 1st of december, the #GivingTuesday. More information are coming soon. THANK YOU FOR YOUR SUPPORT - Africa is nice and has the potential to change!